Check out our recent appearance within Construction In Focus magazine below or view it online. Locke Solutions works predominantly in commercial and industrial projects, from mixed-use developments to mega petrochemical facilities. The company provides solutions to engineers and contractors who are looking for more efficient and safer methods of construction. It designs and manufactures precast concrete structures primarily for underground utilities along with other metal fabrication services. The underground utilities for which Locke manufactures precast structures include power, communication, water-line, storm water, waste water, foundations, , and electrical. Locke Solutions provides an alternate construction method for the contractor by designing and manufacturing concrete structures in its facility prior to installation in the field. The contractor’s original task of setting up molds, fabricating reinforcing steel, coordinating field inspections, scheduling ready-mix concrete on-site, placing concrete, and ultimately, waiting for the concrete to reach design strengths is replaced with setting a cured precast concrete structure in place and immediately backfilling it. Naturally, the precast method reduces safety risks and minimizes weather related delays on the project…not to mention the dramatically reduce manpower and the headaches associated with managing that manpower. The company began in January 2013 with only a handful of people and an empty warehouse. Most of the team had been working together for years with another company in the construction industry and these employees all had a similar goal to create a business centered around its customers and employees. 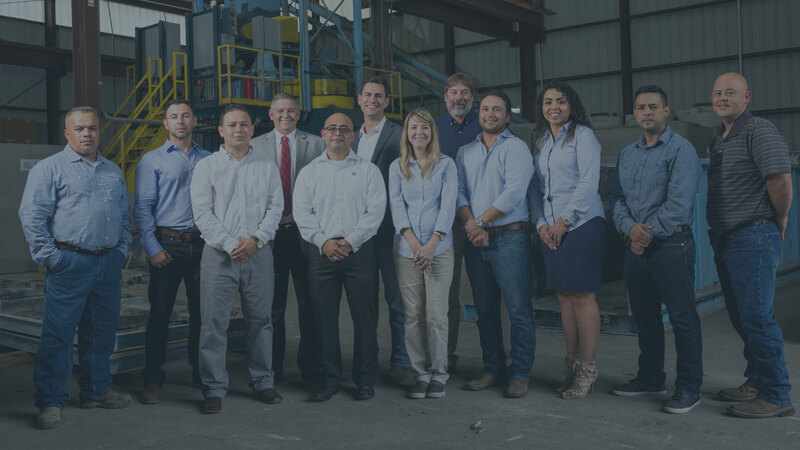 Locke Solutions consists of a sales team, an engineering and drafting department, a transportation department, accounting and human resources department, and a production team. All of its forty-nine employees, including the floor laborers, receive bonuses based on the company’s overall performance. Respect and integrity are held to a high standard within the facility and help maintain a positive atmosphere and culture. Everybody is working towards the same goal of making Locke’s customers’ lives easier. We recognize that the customers are the ones who keep us employed and keep our families fed.” explains Asher. Locke Solutions currently uses a warehouse it leased when it was initially founded. It has added a couple bridge cranes, a concrete batch plant, and other various equipment expansions since then. The company is now in its fifth year, and its customer-first approach has led to rapid pace of growth that requires expansion. It is currently building a new fifty-five-thousand-square-foot facility on a seventeen-and-half-acre piece of land on the south side of Houston that will give the company more than double production capacity and room to grow and expand in the future. The new facility will feature an updated concrete batch plant provided by Mixer Systems, Inc. along with four new overhead bridge cranes provided by OMi Cranes ranging from 10 ton to 50 ton lifting capacities. Locke retained Synchro Building Corporation for the design and construction of the property and tailored the facility to maximize efficiency for a precast and metal fabrication operation all while keeping the employee work experience as a priority. It expects to transition into the newly built property around November 2017. Locke Solutions has designed and manufactured its own precast products for every possible aspect of the new facility including the stormwater catch basins, manholes, and inlets, the sanitary sewer manholes, the storm water quality filtration system through SunTree Technologies, sloping precast trench drains, precast tilt-wall panels, precast stair stringers utilizing RediStair’s patented design and manufacturing processes, hundreds of miscellaneous steel embed plates and angles, and even a 14’ wide precast utility tunnel under the facility that is big enough for a truck to drive through. Throughout the construction process, Locke has also had a chance to call on many of its own vendor partners to supply products from EJ Co providing cast iron, Inwesco providing steel fabricated covers, and VHS Cement providing pozzoslag raw materials. One final distinctive landmark of the new property, as visitors travel up the front driveway of the facility they will be greeted by a 35-foot-tall precast concrete wall panel displaying Locke’s recognizable logo mark, backlit from inside the office. There are many challenges that all construction companies deal with these days, but Locke Solutions tries not to focus on things that it cannot control. Whether the problem is the performance of the economy or what its competitors are doing, it remains concentrated on finding new, great people to add to the team as it expands. “Growth also creates new challenges in the way we handle our employees and what we are doing to make a positive impact on their lives,” Asher says. One of the company’s core values is to develop its employees. It promotes people from within the company, and it encourages employees to pursue different positions within the company if they are interested. This makes the work more fulfilling for the employees, which enhances the quality of work that is delivered. The employees are all aware that there is room to grow in their careers along with the company. Maintaining its level of customer service is another one of company’s priorities. “When we hire somebody on, one of the first things we talk about is customer service, and that’s the reason we’ve grown to where we are right now,” Asher explains. “It is not always the most profitable way to operate, but the customer-first approach creates long-term relationships and loyalty from its customers that are far more substantial.” Other core values of Locke Solutions are Integrity in how it operates and its quality. Locke Solutions batches its own concrete in-house to uphold a higher level of quality with more consistency. It controls what raw materials are used and develops concrete mix designs to meet specifications and create a better looking concrete product. When most job sites are shut down due to inclement weather, Locke has the ability to continue pouring as much concrete as they want, when they want, inside their manufacturing facility. Locke Solutions has been a part of several significant projects in its young history that reflect its abilities and show how much it has grown in almost five years. A great example was a portion of ExxonMobil’s NAG project in Mont Belvieu, Texas. Locke was initially asked to produce several storm drain manholes and box culvert, and the team’s performance led to the company being asked to quote additional electrical manholes structures. The quality of submittals, products, and on-time shipments of those structures led it to providing pipe sleeper foundations and valve boxes. After more success, the company was given a chance to redesign the planned pour-in-place sloping trench drain system in favor of an alternate precast design, which led to huge cost savings and reductions in schedule and manpower needs. Locke Solutions finished the project by providing several thousand feet of concrete traffic barriers to protect and line the entrance of the facility. Since then, the company has also worked with the Houston Airport System on several projects. The team at Locke Solutions has the expertise to handle the technical requirements that go along with designing structures for aircraft and heavy equipment loading at airports and marine ports. These structures usually require unique manufacturing techniques that the company has developed to reduce costs. Locke has provided design efforts along with precast products for electrical, communication, and stormwater structures at Hobby Airport, George Bush Intercontinental Airport, Ellington Airport, and DFW Airport. Recently, the company has been involved with the projects at Port Houston as the port upgrades its infrastructure to accept larger container ships. In addition to providing power and communication manholes, Locke Solutions has developed new ways to construct storm water trench drain systems that have historically been restricted to only pour-in-place construction methods. It is working together with different engineering firms and contractors and continuing to refine a precast concrete construction method along with ABT Trench Drains to reduce project duration and eliminate potentially hazardous safety conditions. The company’s quality and safety programs have been certified through the National Precast Concrete Association since 2014 and maintained a zero rate of recordable accidents through its first four and half years of business. In general, contractors typically prefer the use of precast materials to reduce the risks and overall installation costs, but people often do not realize how complex or how large the structures are that Locke Solutions can design and build. “It is not uncommon for us to design and manufacture structures in the 100,000 pounds range, and to date, our largest structure built was 215,000 pounds, seventy feet long and was shipped to a [liquid natural gas] facility in Freeport, Texas,” says Asher. The value provided by precast structures is easy to see; the hard part is getting the word out and showing contractors and engineers the company’s capabilities. “We are a small business that started less than five years ago. Without the ongoing support of our customers, vendors and especially the employees that took the risk to be a part of this, we would not be in the position we are today,” says Asher. The service Locke Solutions provides to its customers is what sets it apart from the rest. Whether it is turning around a quote request, providing 3D drawing models or how quickly it starts fabricating a special product, no one else in the market compares to it. Stay up-to-date with announcements and product spotlights.